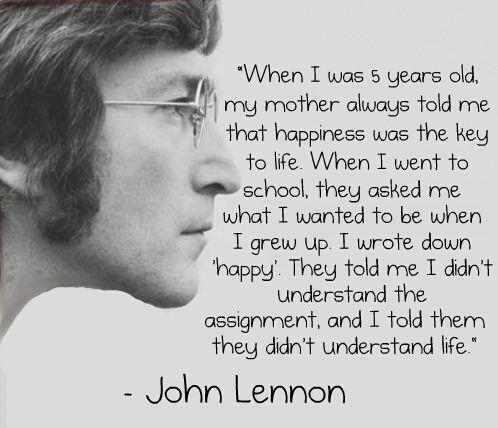 I think this quote by John Lennon is an excellent way to view life. As an adult you will encounter all kinds of people as you go through your day-to-day life. There are those that seem to be going through the motion of life, but not really living it and have an unhappy demeanor. Then there are those who don’t seem to have anything positive in their life, but they appear to be at peace with everything. They have a friendly, positive attitude. I believe that attitude is everything. Your attitude about anything and everything you encounter affects the way you feel and affects the way you are perceived by others. If you encounter difficulties and feel doomed, like you aren’t ever going to achieve anything in life because of whatever it is you are dealing with — a low-paying job, unhappy instructors, difficult children, etc., then you have a negative outlook on life and that negativity will radiate from you and to those around you. If your attitude is to believe in yourself and your ability to overcome whatever obstacles are put in your path, regardless of what you encounter, you will be at peace with yourself and at peace with the world. Those around you may be amazed at your positive attitude. Whatever you are facing in life, health problems, pain, injury, or any other challenge, stay positive. Believe in your own ability to rise above whatever it is you are battling. Take life as it comes, accept its challenges, and most importantly, decide that whatever life throws at you to maintain a positive attitude and to Be Happy.